Some of these options are free, and some cost extra, but many of our readers have found these tips useful to them on their visits to the resort. Take a look, and follow the tips you think will be right for you and your family. 1. Best Time to Go? School vacation times dictate the crowd levels at Universal Orlando Resort. The resort’s location in Florida means many looking to escape the cold will flock to the parks during the winter and early spring, with mid-February through April seeing higher crowds and pricing. The summer months see similar crowd levels and rates, with the addition of heat and humidity. If it’s possible to visit during the off-peak, non-holiday periods from Septemberthrough January, you’ll enjoy the fewest crowds and lowest prices of the year. And of course, Christmas is the best time to visit even if it is in peak season. Unlike Disney World which allows you to take your bags on rides, many rides at Universal Orlando Resort require you to put your items in free lockers (free for up to 45 minutes) before boarding. This can be pretty inconvenient since you have to stop before and after riding. 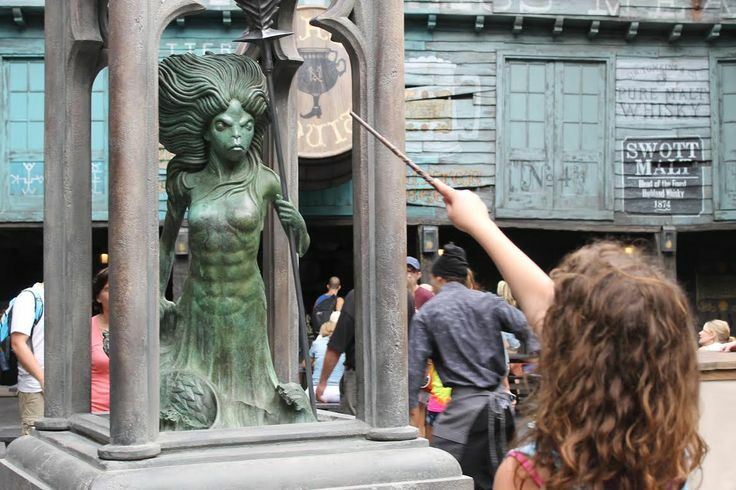 Using interactive wands available for purchase in the park, you can cast various spells throughout Diagon Alley in Universal Studios. Everything at Universal Orlando Resort feels centrally located, and getting from the parks to the hotels and everywhere in between is very easy. Every hotel has the option to take a bus or walk on a paved path. All of the resorts except Cabana Bay also have water taxis available. From the entry point of Universal CityWalk, both theme parks (Volcano Bay ,the third park will open on early Summer 2017) are only about a 5- to 10-minute walk. A water taxi transports guests from the Deluxe Hotels to a dock in Universal CityWalk. The unlimited Express Pass which guests of the 2 Premier hotels (Portofino and Hard Rock) and Royal Pacific get is offered on most attractions. Express Passes allow you to enter a separate queue, much like FastPass, except that you can get in line immediately and don’t have to return later. The 2 newest value hotels Cabana Bay Beach Resortand Sapphire Falls Resort do not offer Express Pass or preferred seating. 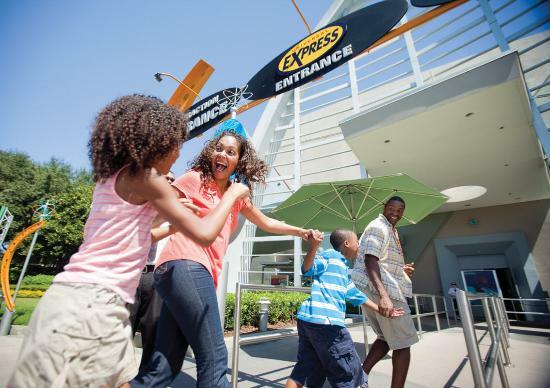 If you’re traveling with young children who don’t meet the height requirement for an attraction, or someone in your party isn’t interested in coming along for the ride, Universal’s Rider Swap program is for you. Rider Swap allows the whole family to go through the attraction’s queue together. Strollers are available for rent inside both parks to the left of the front gates as you enter. A single stroller is $15 (tax included) per day, and a double stroller is $25. Family Services areas are centrally located and provide everything caregivers need for diaper changing and bottle warming. Rocking chairs are available for nursing moms or for resting quietly with a tired toddler. If you walk past the Hard Rock Cafe with the restaurant to your left, then take a left, you can find a second entrance into Universal Studios. Usually open around 10 a.m., this entrance doesn’t hold the same hours as the main one. However, it does let you in the park right next to the Hollywood Rip Ride Rockit. All attractions at Universal Orlando require children to be at least 48” tall to ride without a “supervising companion,” in other words, an older family member or guardian. Most moving attractions at Universal Orlando require children to meet additional minimum height requirements. A few things regarding park tickets. If you want to ride Hogwarts Express, you’ll need Park-to-Park tickets to go between the parks. I highly recommend it if you’re at all interested in Wizarding World of Harry Potter. It’s an attraction worth seeing all on its own. There are a lot more things to know about Universal Orlando Resort. However we shall share them with you momentarily! 20 Things You Must Do in Disney World At Least Once!